Thirty-six-year-old Georges St-Pierre (25-2 MMA, 19-2 UFC), one of the greatest fighters of our generation, will mark his return on Saturday night at UFC 217 in New York City for a shot at the middleweight belt against Michael Bisping (30-7 MMA, 20-7 UFC). St-Pierre, often referred to as GSP, last fought nearly four years ago at UFC 167. After beating Johny Hendricks as a split-decision winner (48-47, 47-48, 48-47) in that bout on November 16, 2013, GSP decided to retire. He had a winning streak of 12 matches and had just retained the UFC welterweight belt at the time, but many agreed that his body had taken a toll. GSP had also grown tired of the constant steroid abusers in the sport, something which continues to taint the UFC and MMA. As a tactical fighter, the preparation and pressure of big fights also played a big role in his decision to leave. 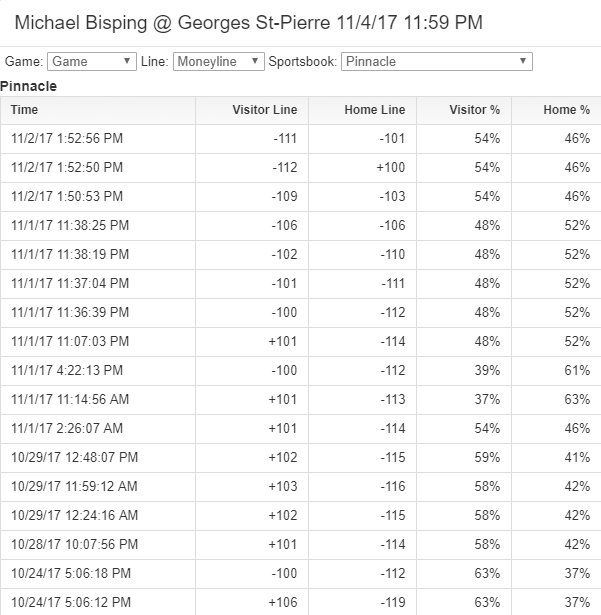 For his return at UFC 217, GSP opened -150 against Michael Bisping back in early August and the line initially rose to -155. However, his odds have steadily dropped over that time as public bettors and bigger money has taken Bisping to win. At Pinnacle sportsbook, GSP isn’t even the favorite anymore. He’s now listed at -101 with Bisping the favorite at -111 odds. The drastic line movement has helped books balance their action though. As you can see from the line history below, more bettors are willing to take GSP now that the odds have dropped. We saw similar 50-cent line movement on the Dodgers for World Series Game 7, but we know how that ended up. If you made a bet against GSP anytime after April 7, 2007, you lost. But this is obviously a much different scenario having gone four years without fighting. Public bettors like to look to recent results when making a wager, and those just don’t exist for GSP. Hence, public bettors have been loading up on Bisping over the last couple months to sway the odds. With the fight expected to go the distance, there may be some value created on GSP now that the line has shifted. Don’t forget there are other great fights on Saturday and our Live Odds page breaks down the ticket counts, public betting percentages, where the money’s going, and more for every matchup. At the time of publication, the line movement was toward the opening favorite in 9 of the 12 matchups. 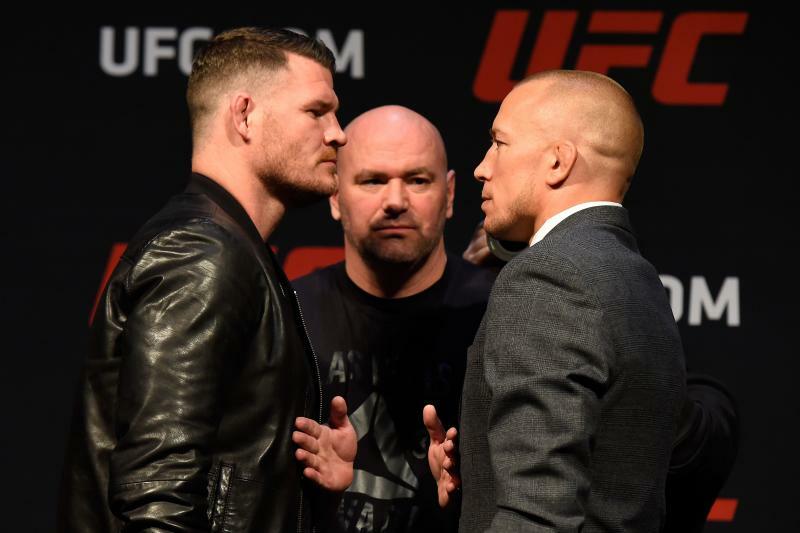 GSP/Bisping is a rare matchup where the public has pounded the underdog and caused line movement that way. Which way will you be betting at UFC 217? Is GSP poised to make it 13 straight wins in his return to fighting?